FILE - President Donald Trump meets with Mexican President Enrique Pena Nieto at the G20 Summit, July 7, 2017, in Hamburg. U.S. President Donald Trump sparred with the leaders of Mexico and Australia in contentious phone calls shortly after he assumed power in January, newly leaked transcripts show. According to the documents, Trump demanded that Mexican President Enrique Peña Nieto stop saying that Mexico would not pay for a wall that Trump wants built along the U.S.-Mexico border to thwart illegal immigration into the United States. During his months-long run for the White House, Trump vowed that he would make Mexico foot the bill. 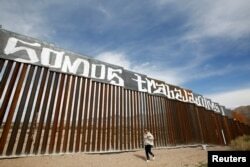 FILE - A group of activists paints the U.S.-Mexico border wall between Ciudad Juarez and New Mexico as a symbol of protest against U.S. President Donald Trump's new immigration reform in Ciudad Juarez, Mexico, Feb. 26, 2017. The paint reads "We are workers." Trump said recently that he still "absolutely" intends to try to make Mexico pay for the $21 billion wall, but in the meantime has asked Congress for funds to start construction. The fate of the proposal, however, is uncertain, with Democratic lawmakers and some Republicans opposed to it. 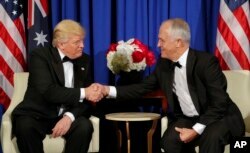 In another even more acrimonious call in January, Trump, who has moved quickly to curb immigration into the U.S., erupted at Australian Prime Minister Malcolm Turnbull as they discussed a deal former U.S. President Barack Obama made with Australia to accept 1,250 refugees into the U.S. FILE - President Donald Trump and Australian Prime Minister Malcolm Turnbull shake hands during their meeting aboard the USS Intrepid, a decommissioned aircraft carrier docked in the Hudson River in New York, May 4, 2017. The White House has not commented about the transcripts. Trump has since met with both Peña Nieto and Turnbull at world gatherings and had seemingly less contentious conversations with the two U.S. allies.